Lumbar chemical radiculitis is a potential consequence of annular tears or intervertebral ruptures that allow nucleus proteins to leak from damaged spinal discs. Chemical nerve irritation remains a controversial theory of pain, since it does not seem to affect patients universally or equally, even when the clinical picture of the condition is exactly the same. In essence, some people seem susceptible to radicular nerve pain caused by irritation from interior disc proteins, while some people seem less prone or even immune to the protein’s irritant potential. Additionally, some people seem to recover organically from the irritating effects of these disc nucleus proteins, while others suffer long-term. Chemical radiculitis in the lower back is the most common location for this diagnosis to occur. This is logical, given the universal occurrence of degeneration and large number of people who demonstrate intervertebral herniation at L4/L5 or L5/S1. Chemical radiculitis is also one of the primary causative factors deemed responsible for the very common symptom set called sciatica. This interesting scientific study concentrates on the anatomy and mechanism of chemical nerve irritation, most often diagnosed as radicular nerve pain or radiculitis in the lower back. Radicular pain is a diagnosis that means symptoms generated by the spinal nerve roots, usually in association with structural compression. Adding the word chemical to radiculitis signifies a substance-related form of radicular pain. 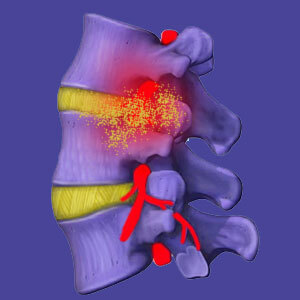 The lumbar spinal discs are composed of 2 distinct components: the annulus fibrosus and the nucleus pulposus. The annulus is a tough, woven-layered outer wall that contains the softer, moisture-rich nucleus. One of the substances inside the nucleus is a protein named tumor necrosis factor alpha. This substance has been proven to be an irritant to neurological tissue in laboratory settings. When the interior proteins of the nucleus escape confinement within the protective annulus, they are free to migrate throughout the local spinal anatomy. These proteins might contact spinal cord or spinal nerve tissue, creating irritation. When this scenario occurs, and symptoms occur, it is called chemical radiculitis. Chemical nerve irritation remains controversial for many reasons: First, scientists wonder why a potent neurological irritant would be stored in a location that would put it in contact with local nerve tissue when universal degeneration occurs. In essence, the evolutionary process should have fixed this error, if indeed the substance was inherently pain-inducing. Next, the structural changes associated with chemical radiculitis, namely intervertebral rupture and migration of interior nucleus tissue, are rather common and widely seen in patients with and without lower back pain. Many patients display ossified intervertebral ruptures that obviously date back many years, but never experienced any related pain. Surgeons have observed completely migrated nucleus tissue that has spread throughout the spinal anatomy when performing many operations, often not even back-pain related. The patient never complained of any symptoms, despite the tumor necrosis factor alpha being in obvious contact with nerve root fibers. Finally, when chemical radiculitis pain is implicated as the source of back ache, patients often respond differently to no treatment or specific treatments. 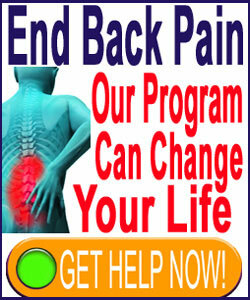 Many patients enjoy organic resolution of radicular pain when the body absorbs or disperses the irritating proteins. This may occur in a few weeks or a few decades, making the source of pain even more suspect in some instances. Likewise, many patients logically respond very well to flushing solution injections that disperse the proteins away from nerve tissues, yet others do not respond at all, even when subsequent surgery shows no sign of any remaining irritating substances. For cases of radicular pain where nucleus proteins are suspected to be the cause, there are a few treatments that work well for most patients. Obviously, management care in the form of drug therapy might be rendered to control pain, but this is a purely-symptom-based practice that provides no hope for a cure. Curative measures usually entail the previously mentioned epidural flushing injections. These injections contain anesthetic, anti-inflammatory chemicals, saline solution and various other substances. The injection is placed into the affected area, most often using live fluoroscopy x-ray for maximum accuracy in finding the treatment area. The substances are injected in an attempt to wash away irritating proteins and are usually effective over several rounds of therapy. For serious and unresponsive cases of chemical radiculitis, surgery can be performed and the spinal canal can be manually cleaned of irritating substances. This is a drastic intervention that is rarely utilized, but may be suggested to patients whose pain is severe and does not resolve with the more moderate care method detailed above.